Noise radiated from a frequency inverter cable is proportional to the amount of varying electric current within it. As cable lengths grow, so does the magnitude of reflected voltage. This transient over voltage, combined with the high amplitudes of current associated with frequency inverter, creates a significant source of radiated noise. By shielding the frequency inverter cable, the noise can be controlled. 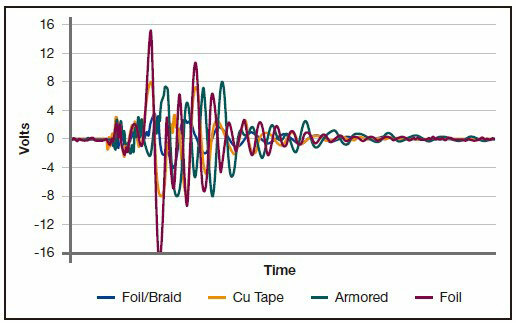 In the tests presented in this paper, relative shielding effectiveness was observed by noting the magnitude of noise coupled to 10 ft. of parallel unshielded instrumentation cable for each frequency inverter cable type examined. The results of the shielding effectiveness testing are documented in the Figure. If radiated noise is an issue in an existing frequency inverter installation, care should be taken when routing instrumentation/control cables in the surrounding area. Maintain as much separation as possible between such cables and frequency inverter cables/leads. A minimum of one foot separation for shielded instrumentation cables, and three feet for unshielded instrumentation cables, is recommended. If the cables must cross paths, try to minimize the amount of parallel runs, preferably crossing the instrument cable perpendicularly with the power/frequency inverter cable. If noise issues persist after these precautions are taken, use a non-metallic, vertical-tray flame rated fiber optic cable and media- converters or direct-connect fiber communication equipment for the instrumentation circuit. Other mitigation techniques may also be required, such as, but not limited to, use of band-pass filters/chokes, output reactors, motor terminators, and metallic barriers in cable trays or raceways.